Asics Dynaflyte 3 are neutral cushioned running shoes. Concept in mind of japanese brand gets closer to become reality with current Asics Dynaflyte 3 although high retail price does help with sales figures. It chases similar approach than eye-candy Saucony Freedom ISO 2 so fight for same (not consolidated yet) target market will be tough. 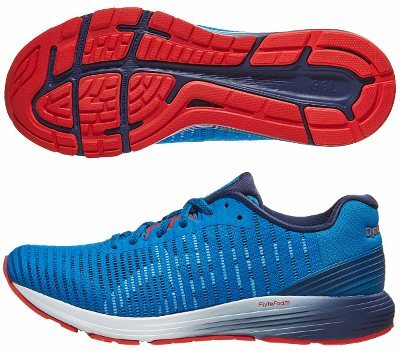 As summary, Dynaflyte 3 is a light (at least lighter than classical ones) daily trainer for neutral runners plenty of cushioning which features premium materials although not as responsive as its performance oriented sibling RoadHawk FF 2. There seems no major changes at first glance compared to its predecessor Dynaflyte 2, but more detailed inspection points some interesting ones out. With clean and modern design, dual layer mesh in upper ("Adapt Mesh 2.0") gets more dense in areas where more support is needed and more open where more breathability is requested. Toe-cap has been raised a bit for quicker transition and special Lite-Show edition is available to increase visibility under poor light conditions. But more interesting feature in Dynaflyte 3 is the first full-length FlyteFoam Lyte™ midsole (with embedded Gel® unit in rear area not visible from outside) which provides plush cushioning at reduced weight but with limited responsiveness. This foam (along with slightly firmer and heavier FlyteFoam Propel™) was first premiered in premium Gel Kayano 25 but it is the first time as main foam in midsole, so feedback from unbiased runners is mandatory. Outsole configuration changes from first two editions and follows same approach than popular Gel Cumulus 20 with no plastic piece in midfoot allowing full-length ground contact. Both main flex grooves in forefoot for improved flexibility and central one (Guidance Line®) are still in place to promote smooth transition.